Le Tréport is located in Seine-Maritime, at the mouth of the Bresle river which marks the line between Normandy and Picardy. The fishing port provides activity throughout the year. At the seaside a pebble beach lined with beach huts is surmounted by a chalk cliff. 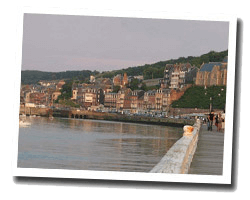 Le Treport is a pleasant family seaside resort. 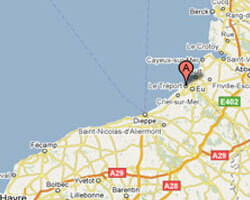 In Le Tréport enjoy a seaview holiday rental. 3 rooms Apartment 52 m2. Distance to the sea: 20 m. distance from town centre: 100 m. Nice view of the sea and the port. 2 Bedroom(s), 2 double bed(s). short stays possibility. Final cleaning : 35 €. 2 rooms apartment in building 3 floors ; 3 balconies facing the sea, view of fishing port and marina. In the town centre, on the main dock . 500m from the railway station . Villa Normande proposes self-catering apartments and studios located in Le Tréport, just 500 metres from the beach and 700 metres form the city centre. Free Wi-Fi access is available. 0 Bedroom(s), 1 double bed(s). short stays possibility. Final cleaning possibility. 4 rooms apartment 52m2. Close to town centre. balcony. 3 Bedroom(s), short stays possibility.